Why yes, yes it is. Spotted just a few feet from my house this past October. 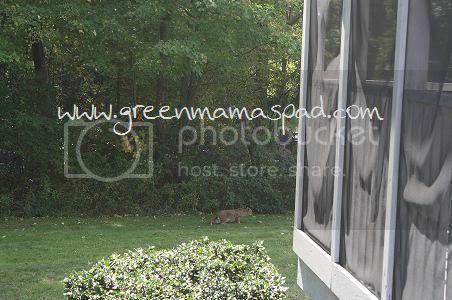 I was in our kitchen when I looked out the window and saw an animal walk out from under our back deck. I ran and got my camera then ran out onto the deck to snap a picture. When I took this picture he was probably about 10 yards from me and stalking something. 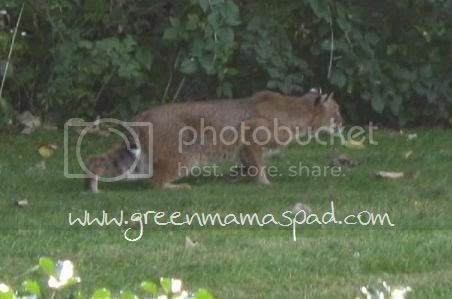 After a lot of googling, doing picture comparisons and even a call to the state it was determined that this was in fact a bobcat. Apparently they are pretty common around here, but this is the first time I ever saw one. Definitely freaked me out a bit. Wow, that's pretty cool, and nerve wracking at the same time! (glad to see you back blogging Marianna! Yikes, I would be scared. So cool that you got a picture of it! It was definitely a little scary. Though they don't usually bother humans, with 4 boys running around the yard you can never be too safe. And tank you Tenille! Its good to be back! Wow, that's crazy that it was in your backyard! Thank goodness none of the boys were outside. He is beautiful. The only kind of wildlife we get are squirels. Oh wow! That would be crazy to see in your backyard. Probably wouldn't send the kids out there to play right away! Cool to see, but I would be worried about the kids! and any pets! gulp! Wow! We have bobcats as well. They don't usually come up to the house, but they still make me nervous. I don't let our chihuahua out by himself anymore. And the kids know to come in when they seem them. Yikes! Glad that is not my backgard. Holy. COW -- I would have been FREAKED out.